I am proud that I was the driving force for the first law on the control of smoking in public places being introduced in South Africa. In 1986, while serving my third term as Mayor, I initiated a process to ban smoking in all municipal buildings. 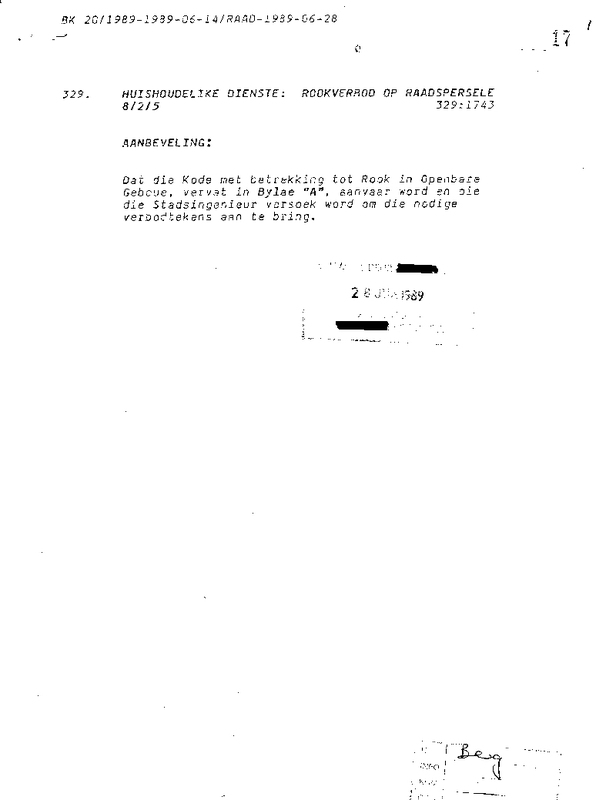 It was a long battle and in 1989 the Resolution was adopted by the Edenvale (now Ekurhuleni) Town Council. Smoking was prohibited in all municipal building, including inter alia the Rates Hall, Licencing Centre, Clinics, Library, workshops, depots and all offices. That was almost 12 years before any national legislation came into force in 2001. I have drafted legislation, addressed parliament on promulgating Acts and trained Environmental Health Practitioners in implementation of the legislation. I have presented papers at international conferences and participated in research. I continue with this work in promoting public health, saving lives and fighting a wealthy industry whose products kill users prematurely. This resolution adopted a Code of Practice banning smoking in all municipal buildings and instructed the City Engineer to erect appropriate signage. 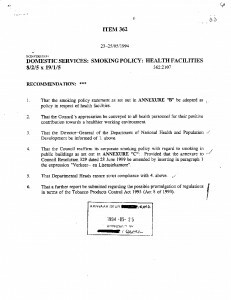 In 1994 the Council expanded the ban on smoking after the Tobacco Products Control Act was Published in 1993. It placed responsibility for implementation on certain officials and took into account the requirements of the Act even though the Act was not yet in force. Under my guidance, The Edenvale Town Council was an active and willing participant in tobacco control. The 1993 Act was amended in 1999 and eventually came into force in 2001. In 1999 I addressed parliament on proposed amendments to the Tobacco Products Control Act. In the years which followed, I was active in promoting legislative changes, addressing various committees of both the National Assembly and the National Council of Provinces and I participated in National and Provincial public hearings. I worked closely with the National Department of Health and the Legal Advisor to the Minister. 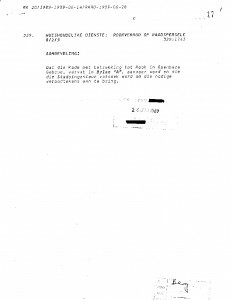 I was appointed as a Director to the National Council Against Smoking in 2001. I attended several World Conferences on Tobacco or Health and presented papers at the conferences. 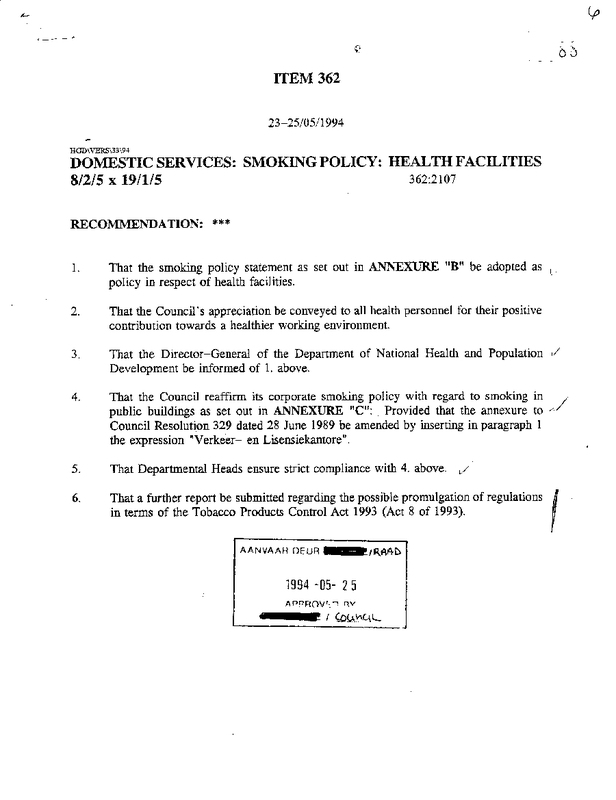 I work closely with the National Department of Health on tobacco control and legislation. I have conducted training sessions for Environmental Health Practitioners, Port Health, South African Police Services, Magistrates, Provincial governments, local authorities and municipalities, universities and businesses. I am a member of the Framework Convention Alliance and have been active in the international meetings which ultimately resulted in the adoption by the World Health Organisation of the Framework Convention on Tobacco Control. South Africa ratified the Treaty in 2005. I have been invited to, attended and participated in many international meetings, working groups and conferences, sharing experiences and learning from other people and countries. I have participated in and assisted with programs in Motivational Interviewing for the Swedish organisation Women Against Tobacco. I arranged and participated in conferences and training programs for the Campaign for Tobacco-Free Kids and the American Cancer Society and presented papers for these organisations. I have worked with the American Lung Foundation on graphic health warning for tobacco products and developed a media advocacy strategy for tobacco control and the NDOH. I have assisted with research for various organisations and have had several papers published.